But enough about how it looks; let’s talk about how it plays. To do so adequately will require more space than I have here, so for now I’m going to focus on my experience leveling my primary class, Conjurer, which is of course a Disciple of Magic and therefore is focused on the combat-centric aspects of FFXIV. If you’re more interested in the Disciples of the Land and Hand, I’ll be covering those in part two. Before we get into the nitty-gritty of progression, let’s take a moment to talk about combat. In the game’s initial launch, combat was slow and often tedious with a great deal of downtime between fights. Combat in A Realm Reborn takes its cues from other major MMOs and doesn’t necessarily deliver anything new. You’ve got your hotbar of abilities, you target what you want to kill, and you execute your rotation. It’s nothing groundbreaking, but compared to combat in 1.0, it’s a big step up. Unfortunately, it’s not without its (sometimes glaring) flaws. A Realm Reborn introduces a more mobility-focused style of combat, as players will frequently be required to move out of large attacks, which are telegraphed by red area-of-effect indicators on the ground. 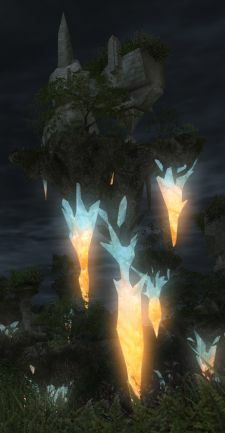 FFXIV Gold In theory, this is a great addition to the combat system that requires players to stay on their toes if they don’t want to end up taking a dirt-nap. In practice, however, it leaves a lot to be desired. Enemy attack animations rarely sync up with the ability’s cast time, and since the game determines whether or not a player is hit based on his location when the ability finishes casting rather than when the animation plays or when the red AoE indicator disappears, this can lead to great deals of frustration when you seem to have dodged the attack but end up taking damage anyway. There’s also a noticeable, pervasive sense of delay in ability executions. It’s something that’s hard to describe but very evident if you actually play the game. Abilities that are supposedly off the GCD often don’t execute when you want them to (generally while the GCD is ticking down), and it feels as if I often have to wait for ability animations to finish before I execute another one, even though the cast time itself has already finished. In general, combat just feels… unresponsive. I find myself all too frequently mashing an ability’s hotkey over and over just to ensure it executes properly. And one more thing that I have to gripe about as a healer is the game’s targeting system. For some reason it seems to be virtually impossible to target allies when they’re in motion (and sometimes when they’re standing still, for that matter), which makes healing players not in my party exceptionally difficult. The game’s overhead nameplates don’t make matters any easier, as they seem to be just as elusive to my mouse-clicks as the character models themselves and are often concealed by scenery, mobs, and other players. The thought of adequately healing non-group members in large FATEs is downright laughable. Next PostNext This gen: Is Skyrim the high point?